We all want better family photos. Hiring a professional photographer to document a new baby in their first few days of life is an investment that is well worth the time and money. You’ll have professional quality images and prints to cherish for the rest of your life, freezing that moment in time when they are brand new and fresh, their tiny toes and fingers, their perfect skin and baby hair, and their incredible tininess in your hands. 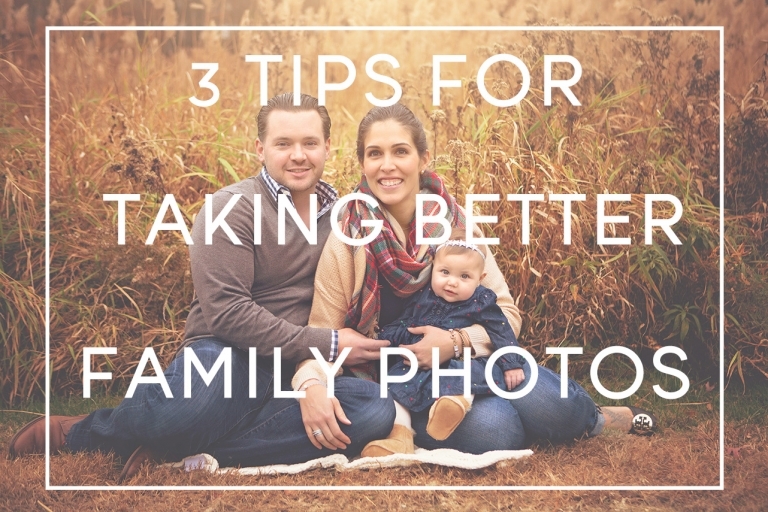 But since you can’t hire a professional photographer to follow you around all the time, I put together a few tips to help you take better family photos on your own, in between your annual family sessions, that you can print yourself! 1. LIGHTING IS THE MOST IMPORTANT THING FOR BETTER FAMILY PHOTOS! Phone and compact digital camera flashes are NOT flattering! We can’t all walk around with professional lighting, but there are a few things you can try at home. Photographing in dark places will give you poor quality, noisy images and you’ll lose all the great detail of your baby! So what should you do? If its nice out, Go outside! Morning and late afternoon/early evening are the most flattering times of day for sunny days. If you take photos at noon outside, the sun is directly above you and creates unflattering shadows. 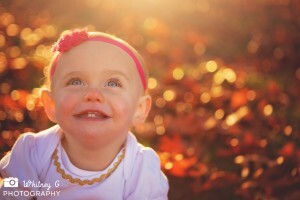 Additionally, bright sun in your baby’s eyes will likely create squinting and unhappy faces. Try to keep the sun behind or to the side of your subject to avoid this around sunset, for my favorite, sun-drenched look. This is what I do at every outdoor Family Session! If you have to stay inside due to the weather or time of year, try to use the window as your light source. Place your kiddo facing you, and at a 45-90 degree angle to a window for the most flattering light. Pay attention to how the light looks on your baby’s face and what shadows you’re creating. You can get creative here and use the light to be dramatic, or keep it classic! 2. PAY ATTENTION TO YOUR BACKGROUND! After lighting, this the next most important. When I do family sessions, I choose a nice park and try to find 3-4 different spots with pretty backgrounds. My favorite are big trees to stand under, tall grass or reeds to sit in front of, a clear path to draw your eye across the frame, or some kind of visual interest, like a bridge, a body of water, or pretty trees to fill the background. The idea is to surround your subject with something that will make them stand out. We want to create a beautiful frame around your happy faces and connection. The focus should be your family, NOT the background. The background should just enhance YOU! This is key for better family photos. 3. DON’T JUST POSE, HAVE FUN! During my family sessions, I really don’t like to “pose” you. I put you in front of a great background, which I pick based on the direction of the light, and basically have fun and let your personality shine through! Personally, I like a variety of smiling/looking at the camera, and candids! So play peekaboo, ring around the rosy, or tickle, make funny faces, get action shots of your kiddo’s first steps, and have fun! There are also small things you can do to make your family look more flattering. If you’re sitting, keep your legs to the side to avoid “weird short leg syndrome.” Get closer than you think you should (you’re family, its fine!) Try to shoot from above, which means if your subject is sitting, stand or kneel so you are above them–you don’t want to photograph up someone’s nose! If they’re standing and taller than you, stand on something. Shooting from below is very unflattering. We want you, your spouse, AND the kids to look their best. © 2019 Boston Newborn Photographer – Whitney O'Brien Photography|ProPhoto Website|Design by Northfolk & Co.